Food Blogga: How Long Is Your Rhubarb Season? How Long Is Your Rhubarb Season? It's rhubarb season. Or is it? I started asking for fresh rhubarb over a month ago, only to be told by market managers, "It's too early." Then this past week I was told, "It's too late. Rhubarb season is over." So, by my calculation, rhubarb season in Southern California was about two weeks long this year. That's absurd. It's a good thing I bought rhubarb three times in that two week window. But it wasn't enough for this New England bred gal. When I was a kid, rhubarb season was usually a couple of months long. You didn't have to buy it at the market because half of your neighbors grew it in their yards. I remember going to my great aunt's house where those crimson stalks stood at attention along the side of her house. I'd rip one right of the ground and bite into it like it was a carrot. I'd do it till my eyes watered, my lips went numb, and my belly turned sour. Ah, those were good days. Nowadays, I have to rush to get my rhubarb fix. And rhubarb should not be rushed. Berry Rhubarb Compote with a dollop of ricotta cheese. Since my belly isn't as steely as it used to be, I forego raw rhubarb for stewed, sweetened dishes like crumbles, crisps, and compotes. I have made many rhubarb compotes, but this one is special. The rhubarb is tempered by sugar and enhanced by freshly squeezed orange juice, aromatic ginger, and sweet blueberries. Compotes are best served warm or at room temperature with a dollop of Greek yogurt, vanilla ice cream, mascarpone cheese, or ricotta cheese. If you've got leftovers, then swirl it in your oatmeal, spread it on toast, or just eat it by the spoonful. Rhubarb season generally runs from April to September. So, I'm curious, what's your rhubarb season like where you live? 1. 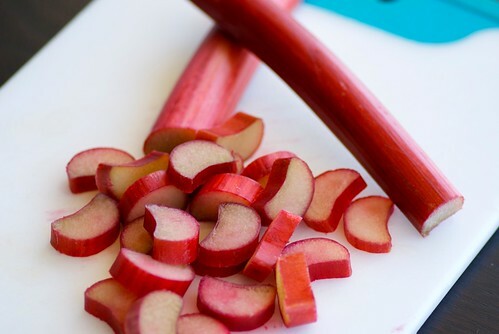 Place rhubarb, sugar, water, and juice in a medium pot over high heat. Bring to a boil for 2 minutes. Add zest, berries, and ginger. Lower the heat and simmer for 4-5 minutes until the rhubarb is soft but still has some shape. Cool. Serve warm or at room temperature with a dollop of Greek yogurt, vanilla ice cream, mascarpone cheese, or ricotta cheese. A couple of my So Cal friends have also complained of not being able to find it. We start getting forced rhubarb from Yorkshire as early as March, for those of us who are impatient. We're probably nearing the end of our season here, but we English are HUGE rhubarb fans, so it's plentiful if the shops throughout Spring. I have made a few desserts already and am doing another rhubarb and apple crumble tomorrow. This compote looks gorgeous. I'd love that with some whipped cream and meringue, like an Eton Mess. YUM! I better get out there and buy some rhubarb before it's too late - and make this delicious looking compote. Rhubarb season is short. we can find it from the end of April till the middle of June. Yeah rhubarb season lasts until late june here (NYC)...I'm sorry. But your strawberry season is way longer than ours! Actually your season for most delicious things is way longer than ours. I love the looks of this compote. Given my current Greek yogurt obsession, it seems necessary that I make this! I love rhubarb season. I can't get enough. Love your photos and the compote looks delicious. My Midwestern mother just about fell off her chair when I told her how much rhubarb costs here. People give sacks of it away on Freecycle in Minnesota! I'm planning on freezing some rhubarb for a crisp this summer and hope to find some while we're back home this weekend. Rhubarb used to be plentiful here, but the last few years it has been difficult to find, and expensive. We seem to get two seasons-late winter greenhouse forced rhubarb, and then the real stuff now.My mother always had a couple plants-I really don't know why I've never planted any. I made some rhubarb cordial to enjoy the rest of summer, but I think I'd better hunt down a few more stalks to freeze.It does freeze rather well. jessica-Never? We have got to rectify that. Quickly! girlfoodies-You are so right. The Brits have a way with rhubarb to be envied! Rhubarb and apple crumble? Mmmm... that sounds scrumptious! rose-That sounds about right to me. happycook-Everything always tastes better when it comes from a garden of someone you love. Enjoy! thefrench-Let me know if you score some! ames-That's rhubarb gluttony! ;) You must be swimming in jams and jellies too! stacy-I know! I paid $4.99/lb last time. Eat it up when you visit your mom. Safe travels! as of last week, not a stalk left in the NJ markets! boo hoo. I love rhubarb. goody-A rhubarb cordial? That must be fabulous! I remember sitting in my neighbours garden with my gal pals with a sugar bowl in one hand and rhubarb in the other. Glad to hear from you after such a long time. Rhubarb grows in Nothern Greece but there isn't enough to make it to Athens and unfortunately have only tried it in syrup. BTW mahalebi is not connected with mahleb. I love all your rhubarb recipes. I'll have to try this one. We still have rhubarb right now in MIchigan. Rhubarb season seemed to come early this year and only last three weeks. But I did have it three times including this recipe. It's better than strawberry/rhubarb pie. Our Rhubarb season arrives late in Fairbanks. My first harvest will be this weekend. Once it gets going it won't stop until things freeze up in September. I have several huge plants around our property. I use as much as I can fresh then freeze as much as I can to fill up the freezer around the blueberries, cranberries, and raspberries and finally give the rest away. The giving away can be challenging as everyone seems to have plenty of the stuff, it is kind of like zucchini here. Unfortunately, we don't get much in the way of strawberries though. I find the topic of rhubarb very frustrating! I was raised in the midwest and would eat the stuff right out of the ground like you did. Now I live in Los Angeles and can't find it anywhere (even frozen). I did manage to find a few limp stalks at Whole Foods a couple of weeks back, but nothing since then. I guess I'll have to start freezing my own (if I ever find it again!). I grew up in upstate ny and we grew rhubarb in our backyard. Well...it grew on it's own, it was there before my parents ever moved in. Now I'm in San Diego and I went looking for fresh rhubarb last weekend and Whole Foods was all out, Trader Joes had none, and nor did Ralph's (that's not as much of a surprise). But whole foods does have frozen rhubarb if you're in a pinch. I bought all my ingredients for a strawberry rhubarb tart, only to find that there was no fresh rhubarb to be found. I made it with frozen, and it was still really great. We have months here in Wisconsin - thank goodness, because there isn't much else to work with except for asparagus and wild ramps. Luckily it is such a versatile vegetable. The compote looks lovely - a nice addition to all of the custards, cakes, ice pops and more we've been downing here! I don't think rhubarb grows locally here, and I usually only find it in grocery stores for a short two week period in early spring. 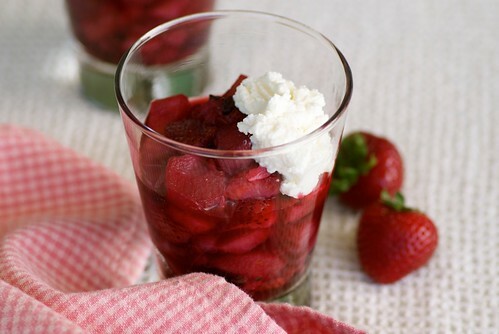 Your compote looks fantastic with ricotta! Normally I wouldn't even have the answer, but I'm told there is a "rhubarb experiment" underway at my CSA. As a willing lab participant, I'll let you know what I find out! Over here in Southern England, our rhubarb season seems to last all summer (or it certainly can anyway). We have a couple of plants in our garden, and we took thr first harvest last week. We should be able to keep taking it until it's too cold for it to grow. I can't imagine not having rhubarb easily available. We're attempting to force some this year, by placing a bucket over them. But they grow so big (well, over half a metre anyway) that they push the bucket off the ground. When I get my own home I'm definitely planting some rhubarb. I see that you’re interested and fascinated in food stuffs. This is awesome Berry Rhubarb Compote. You see, we have this food site Foodista.com (http://www.foodista.com) that is a food and cooking encyclopedia that everyone and anyone can edit. Maybe you are interested in sharing some of recipes to us or share your knowledge about food stuffs and techniques, or maybe you just like to write reviews about food, restaurant and recipes...why don't you visit us sometimes, if its food you're interested in, then we are interested in you. Don't hesitate to check us out. This compote looks divine especially with the ricotta. And rhubarb?? I did not know it really existed. I just read about it and saw photos in magazines. A few years back it started appearing in my grocery. I still have not tried it. Yours looks tempting! I didn't realize rhubarb season was so short either! This looks completely amazing and so, so pretty!! I live in San Diego and grow my own rhubarb. I am constantly begging my friends to take some, it grows almost all year long! I can harvest a pound a week between February and September. It does seem to freeze well, too (which I tell people so they'll take more!). My favorite recipe is actually a persian rhubarb stew with lamb and lots of cilantro and parsley, it's very tart and tangy. You are very welcomed to have some of my rhubarb! It's so big it's shading my pumpkin plants! I've still got rhubarb growing, but I'm not sure how to tell when the season is over. Does it go bad? Does it stop growing? Here in Ontario (Canada) our rhubarb season is actually pretty long if you take into account our ‘forced’ greenhouse varieties which we will start seeing around January. Our outdoor variety however we will see from about May until about the end of June. The sad part of that story is that this recipe (which I would love to try) calls for blueberries which we won’t see around here until July :( Our strawberries will be out here in about two weeks so I will keep my fingers crossed that we may get some crossover at the farmers market between the rhubarb, strawberries and blueberries. I love the idea of the blueberries and rhubarb. I've just recently cooked with this amazing ingredient. Your compote looks amazing! I completely agree with you regarding the shortness of the rhubarb season here in CA. In the cooler, wetter climates of New England and Northern Europe, rhubarb reigns in the garden for months. In B.C., our season for picking, runs from March until the end of July. It's by choice that I don't pick after that,to let the plant build up strength for next year's bumper crop from the remaining stalks that last until first frost..in Oct? I happen to have a rhubarb upside down cake in the oven as I type. The nutmeg aroma is heavenly! In Finland the rhubarb season is from June to August I think, perhaps September? I don't think it has started yet. I'm just waiting for it to start, I have several recipes lined up. Susan - the colour of that compote is stunning!!! In Germany, the Rhubarb Season ends on the same date as the white asparagus season ends: On the day of St. Johannis, which is the 24th of June. But it only ends to strengthen the rhubarb for the next season. Hi susan, Checking in from far northern CA where rhubarb is growing in my garden at this very moment. It doesn't get very big, nor the stalks very long, but it does grow year-round. As others have said, I think it does well in cooler weather. I think retailers stick with a "strawberries and rhubarb season" then don't try to order it after that. If demand kept up, I bet supply would also. IMHO. Beautiful compote! !